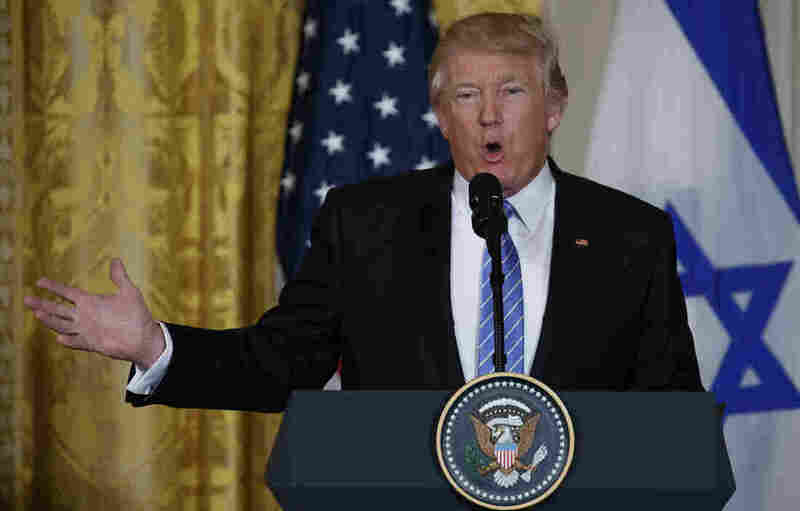 Inside The White House, Trump Changes His Tune On Leaks Leaking classified information is a crime, but it's also one of the most popular sports in Washington. Candidate Trump encouraged leaks. President Trump calls them a crime. President Trump, speaking at the White House on Wednesday, criticized the leaks surrounding his departed national security adviser, Michael Flynn. On the campaign trail, Trump encouraged leaks against his rival Hillary Clinton and said they were inevitable. Candidate Donald Trump was a big fan of leaks, especially when they targeted Hillary Clinton and reports of her deleted emails. "Russia, if you're listening, I hope you're able to find the 30,000 emails that are missing," Trump said last July in Florida. "I think you will probably be rewarded mightily by our press." Now in the White House less than a month, President Trump is far less enthusiastic about leaks in general, and those involving Russia in particular. "That was classified information that was given illegally. That's the real problem," the president said. "We're looking at them very, very seriously. I've gone to all of the folks in charge of the various agencies and I've actually called the Justice Department to look into the leaks. Those are criminal leaks." Leaking classified information is a crime, but it's also one of the most popular sports in the capital and is the bane of every administration. Barack Obama was extremely frustrated by unauthorized disclosures, and during his time in office, nine alleged leakers were prosecuted, more than by any other administration. Trump may be at a particularly vulnerable moment right now since the White House has just changed hands. It takes time to fill several thousand government positions, which means some Obama holdovers have remained in place, and they might be inclined to spill secrets as they walk out the door. In Trump's first days in office, early drafts of his executive orders circulated widely, as did details of his phone calls with foreign leaders. There was also a hint of this when The Washington Post broke the story last week that Flynn had discussed sanctions in telephone calls with the Russian ambassador at the end of December. The story cited "nine current and former officials, who were in senior positions at multiple agencies at the time of the calls." The nine were not further identified and their precise motives for leaking aren't yet known. But the story suggests that at least some of them were leaving the government along with Obama and were likely motivated by a desire to undermine and embarrass Trump and Flynn. Flynn reportedly told then-Vice President-elect Mike Pence that he didn't discuss sanctions with the Russian ambassador, and Pence stated this in a television interview on Jan. 15. While Trump fumed about the leaks that revealed this, former Obama adviser David Axelrod told CNN why he thought the disclosures were a good thing: "Were the media not pursuing these things, I'm not sure Mike Pence would still know he was being lied to by Gen. Flynn." Leaks often involve a single high-ranking source and a few selective details about bureaucratic infighting in Washington. But technology has made possible a new era of large-scale disclosures by relatively low-ranking government employees who have access to highly sensitive information. Back in 1971, Daniel Ellsberg leaked the Pentagon Papers to The New York Times, revealing that the military establishment knew early on that the Vietnam War was going badly but continued to paint a rosy scenario. Ellsberg said it took him many days to photocopy the thousands of government documents one page at a time. Fast forward to 2010, when Army Pvt. Chelsea Manning was able to pass on hundreds of thousands of government documents to WikiLeaks. Manning was sentenced to 35 years in prison. Obama commuted her sentence just before he left office, prompting Trump to call Manning an "ungrateful traitor" who should never be released. And Edward Snowden was a contractor for the National Security Agency when he spilled the details of the NSA's bulk surveillance programs in 2013. Snowden remains in Russia and is under indictment in the U.S., where he is a polarizing figure. Supporters say he should be pardoned for showing the extent of government eavesdropping, while detractors say he undermined the country's security and deserves to be prosecuted. One common thread: Many leakers have said they either tried to raise their frustrations officially and nothing happened, or that they didn't trust their own superiors to get the word out. NSA whistleblowers told WGBH's documentary show Frontline that they got nowhere with using proper channels, and their cases may have inspired Snowden to blow the whistle as openly as possible. And in a 2013 interview with NPR, Ellsberg said he initially tried working through the system, but to no avail. "I wasted years trying to do it through channels, first within the executive branch and then with Congress," he said. "During that time, more than 10,000 Americans died and probably more than a million Vietnamese." "That was a fruitless effort, as it would have been for Manning and Snowden," he said. As much as administrations complain about leaks, they rarely hesitate to use them to their own advantage. After the 2011 raid in Pakistan that killed al-Qaida leader Osama bin Laden, the Obama administration poured out details of the operation so it could bask in the limelight of a great success. Adm. Mike Mullen, then chairman of the Joint Chiefs of Staff, got so frustrated he urged his own administration to shut up. Yet the government launched a criminal investigation of Matt Bissonnette, a member of Navy SEAL Team 6, when he wrote an unauthorized book, No Easy Day, about the raid. The case was settled last August when Bissonnette agreed to forfeit $6.8 million in book royalties and apologized for failing to get the book cleared in advance with the Pentagon. His book is just one of many in recent years by former members of the military and the national security establishment, which has led to criticism that they are revealing too many details. But they are hardly alone. When looking for leaks, a good place to start is Capitol Hill. The disclosures are so plentiful that calling them congressional leaks somehow seems an understatement. A fire hose metaphor would be more apt. There once was a time when administrations could reasonably assume that sharing sensitive national security material would remain private when presented to Congress. But many of those traditions have faded in this highly partisan era. When Obama administration officials briefed Congress, they knew that Republican members and their staffers would be prone to leaking. The Trump administration is already discovering the same thing.